In the grounds of Alfreton House with stalls, fair and live acts on stage. Santa will be in his grotto too. 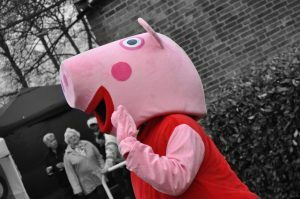 Peppa Pig will switch on the lights with Cllr John Walker at 7pm. The Town Council has been forced to withdraw from a project to try and deal with the pigeon nuisance on Institute Lane after receiving notification from Amber Valley Borough Council that the authority were no longer partnering on the project in spite of being responsible for Environmental Health. As part of the initial stages of the project the Town Council pressed for signs to be installed on the lamp posts to asked the public not to feed the birds, but the next steps on the project have now been abandoned. The Town Council are again reminding the public not to feed the birds as it encourages pigeons and other rodents. 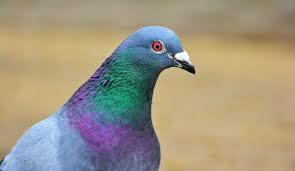 Pigeons are wild animals should not depend on humans to be a source of their food. Food waste makes the area dirty, attracts flies and rats together with bird droppings from the overfed animals which creates health issues also causing detrimental effects on buildings and the appearance of the town. Posters will also be distributed to shops in the area to display and remind the public not to feed the birds. Concerned residents are asked to contact Amber Valley Borough Councils Environmental Health team on 01773 570222. At the Party in the Park 2017, Alfreton Town Council members held a stall to raise awareness of what services the council offer. 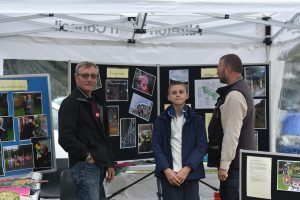 Visitors to the stand were greeted by members and asked for their priorities for the town along with suggested names for the Village Green on Outseat’s. Once the information has been collated it will be published here and on social media. 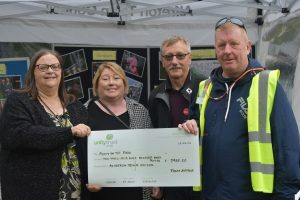 A cheque for £2960 was presented to Liam Connell by Councillors M Kerry, G Dolman and S Marshall-Clarke from the grants fund of Alfreton Town Council. This purchased the hire of the marquee and chairs for the event.